Welcome Winter with a magical Faire experience! 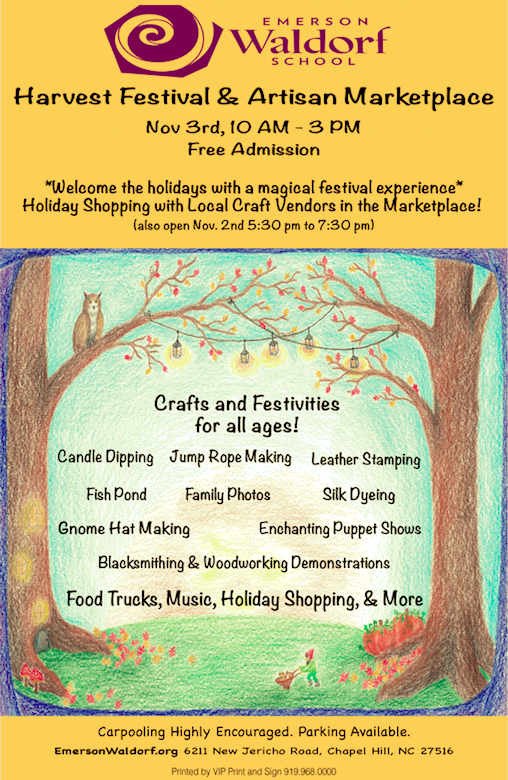 Welcome fall with a magical faire experience at the Emerson Waldorf Harvest Festival and Artisan Marketplace on Saturday, November 3, 2018 from 10:00 am until 3:00 pm on the campus of Emerson Waldorf School, 6211 New Jericho Rd., Chapel Hill, NC 27516. Children of all ages will enjoy crafts, gift-making and merriment, food, entertainment and more. Vendors from around the Triangle will share their handmade gifts. Crafts include candle dipping, fish pond, gnome hat making, gem mining, leather crafting, and silk dyeing (grades classrooms). Entertainment includes 2 puppet shows (5 performances), music, and blacksmithing and woodworking demonstrations. Outdoor activities include jump rope winding, cake walk, and holiday photos. Please invite your friends and neighbors to share this wonderful day with our community! Adults can enjoy a special Friday night shopping experience in the Artisan Marketplace from 5:30-7:30 pm on Nov. 2! This is a 21 and up event. Complimentary wine and cheese is offered.